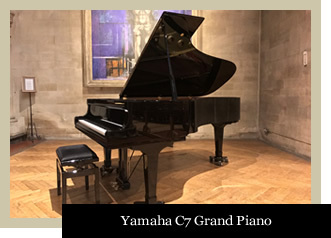 The Yamaha C7 grand piano was acquired in 2018 for use during educational events, concerts, and worship. Yamaha have been crafting pianos since 1887, building a long-established tradition for quality, design and craftsmanship. At 7 feet 6 inches, the piano fills the entire room and is the ideal size for solo, chamber, and choral accompaniment, and even piano concerti. The piano is undoubtably the highest quality instrument in an affordable and flexible concert venue in Northampton. Please be in touch with the Parish Office should you like to inquire about using one of our world-class instruments during your concert or event.